The B3 DNA binding domain (DBD) is a highly conserved domain found exclusively in transcription factors, from higher plants (≥40 species) (Pfam PF02362) combined with other domains (IPR003340). 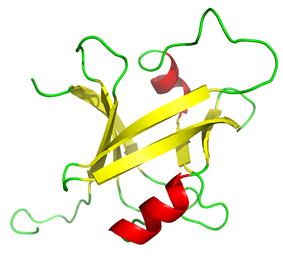 It consists of 100-120 residues, includes seven beta strands and two alpha helices that form a DNA-binding pseudobarrel protein fold (SCOP 117343); it interacts with the major groove of DNA. ​ and ​ are only known NMR solution phase structures of the B3 DNA Binding Domain. The N-terminal domain of restriction endonuclease EcoRII; the C-terminal domain of restriction endonuclease BfiI possess a similar DNA-binding pseudobarrel protein fold. Classification in the "Transcription factors" table according to the Transfac database.